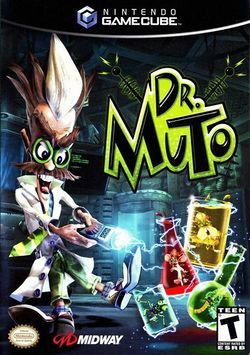 Dr. Muto is a 2002 video game by Midway Games for the Nintendo GameCube, Xbox, PlayStation 2, and Game Boy Advance. The game tells a story of a doctor who plans to rebuild the planet he destroyed by building a machine. In order to do so, he must find the part on different planets. Dr. Muto, a mad scientist, must rebuild his homeworld, Midway, after his evil rival, Professor Burnital, sabotages Muto's machine that would have provided free, renewable energy for the planet, but instead, destroys it. Muto is aided by his sentient computer, AL. This page was last edited on 28 July 2009, at 08:56.